Tomorrow I am headed to Salt Lake City, Utah for the annual lifestyle and design bloggers conference, Alt Summit. Since a lot of creatives and designers attend Alt Summit, business cards have become kind of a huge deal. Some people just hand out cards, and some people hand out cards on steroids. My cards are somewhere in the middle. 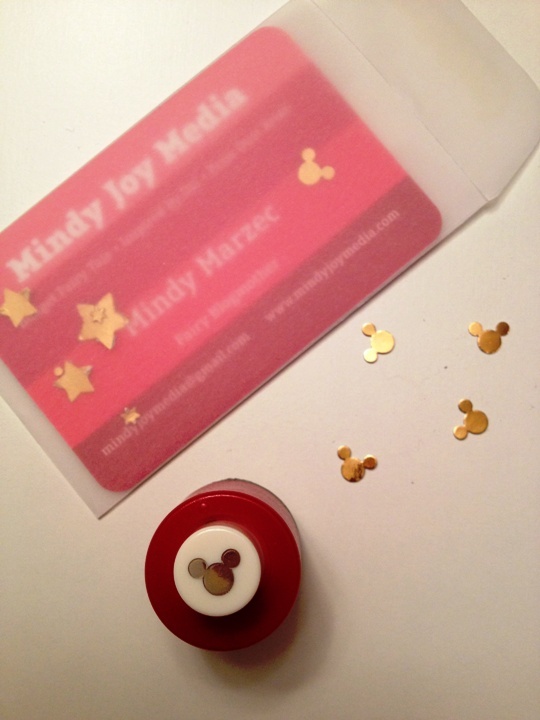 This time around, I’m more focused on promoting myself and branding myself as a DIY and Disney blogger. 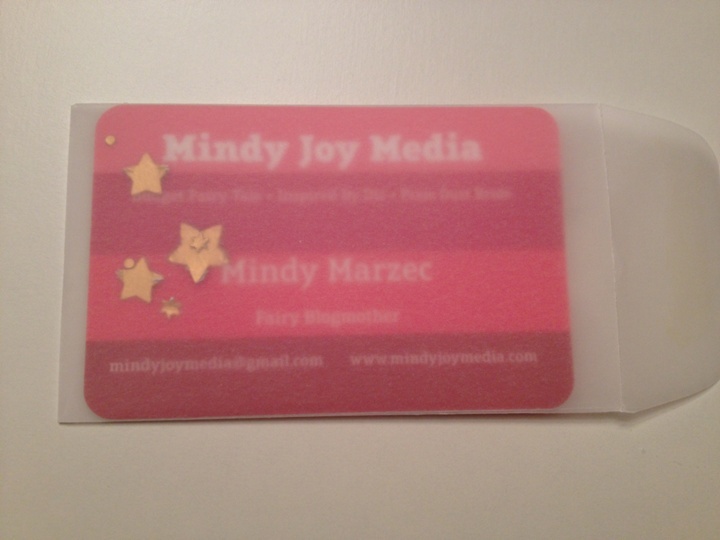 I actually had these same pink striped cards from Moo, promoting my business Mindy Joy Media, last year and I passed them out along with my Blogging It Forward packets. 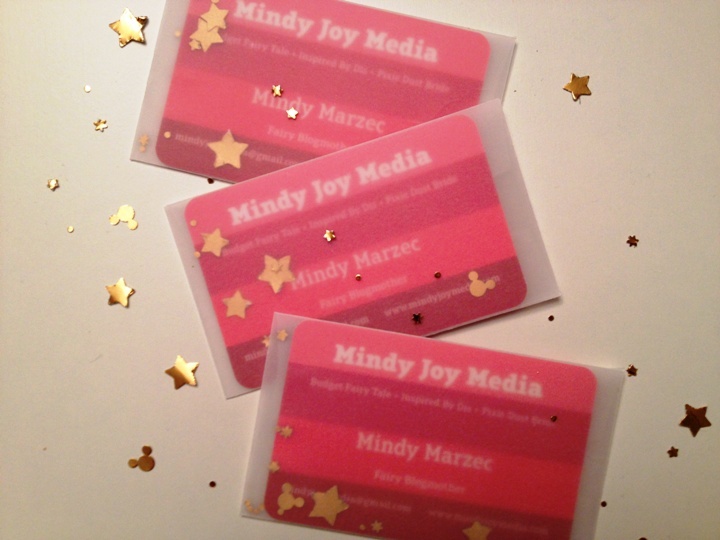 This time around, the focus will be on my Mindy Joy Media cards and I also have some Blogging It Forward cards (not packets, just the business cards) to pass out, too. Kind of a reversal from last year! 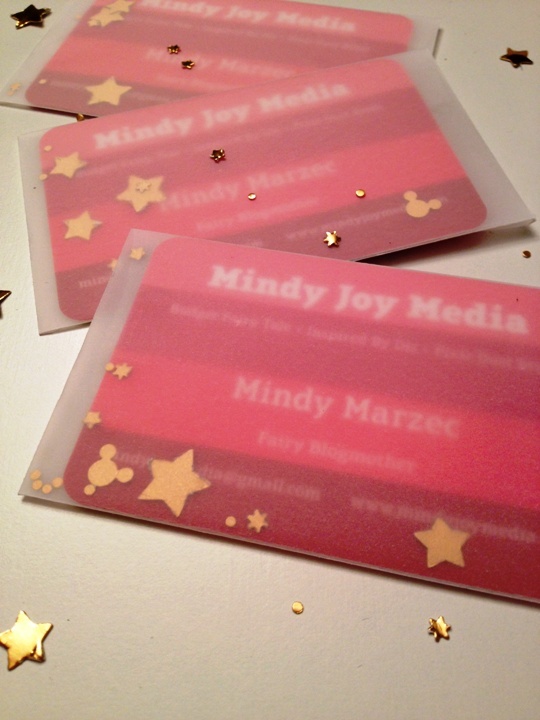 For my newest site, Inspired By Dis, I did a few DIY projects with my Mickey Mouse punch and gold foil paper, which inspired these card packets. 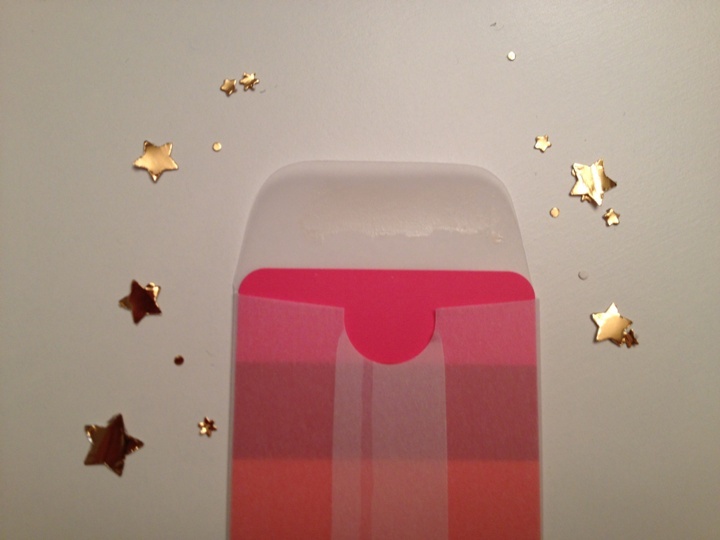 I also had the star confetti punch by Martha Stewart and I thought it fit the Disney theme nicely. 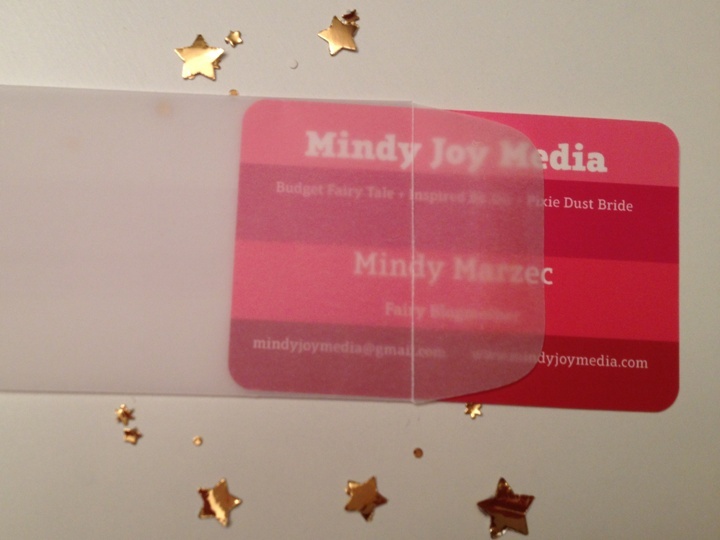 I decided to put my business card in a vellum envelope with some gold star confetti and a Hidden Mickey. 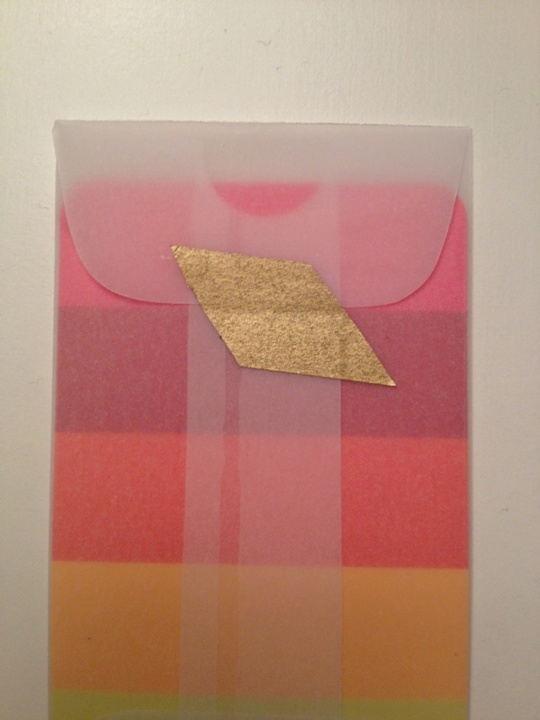 Then I sealed the envelope with some gold washi tape. The card is a tight fit in the envelope, so I used a circle punch to punch out a half circle on the envelope to make the card easier to grab. But still, I think the best solution to get the card out is to tear the envelope! Lessons learned from buying 200 of something on eBay without being able to test them first. Next I punched out some gold stars and placed them into the envelope. Then I added a gold Hidden Mickey to each packet. 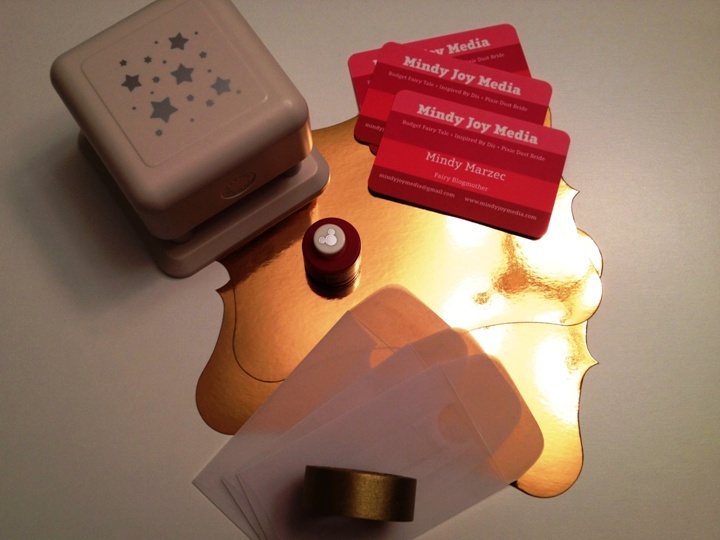 The last step was sealing the envelope with gold washi tape, because who doesn’t love washi? Aside from the envelope being slightly too small for the card, I’m very pleased with how these turned out! I tested it out on my friend Liz when we met for coffee a couple days ago, and when I handed it to her, her voice went up an octave and she said, “Ohhhhh, cuuuuuuuute!” which was my desired reaction. I can’t wait to pass these out at Alt starting tomorrow!! Very cute. Have a great time at your summit. I’m hoping to get to a blogger event this year, they look like so much fun! I really recommend going to a blogging/networking conference at least once a year. It’s a good investment in your business and you’ll make a ton of new friends! I’m just now going through all the ENMN biz cards I got, which led me here  yours were very cute! I would have missed the hidden Mickey except you pointed it out to me at the RV park, it had fallen out of the package.